Eschscholzia californica is the most widespread species, extending from the Columbia River Valley in southwestern Washington south into the Baja California peninsula and sporadically on to the Cape Region, west to the Pacific Ocean, and east to western Texas. The species is highly variable, including long-lived prostrate perennials along the coast, erect perennials of inland valleys, and annuals in the interior. Two subspecies are recognized, ssp. californica of California, Baja California, west central Nevada, Oregon, and Washington, and ssp. mexicana (E.L. Greene) C. Clark (the Mexican goldpoppy) of extreme eastern California, southern Nevada, Utah, Arizona, Sonora, Chihuahua, New Mexico, and Texas. 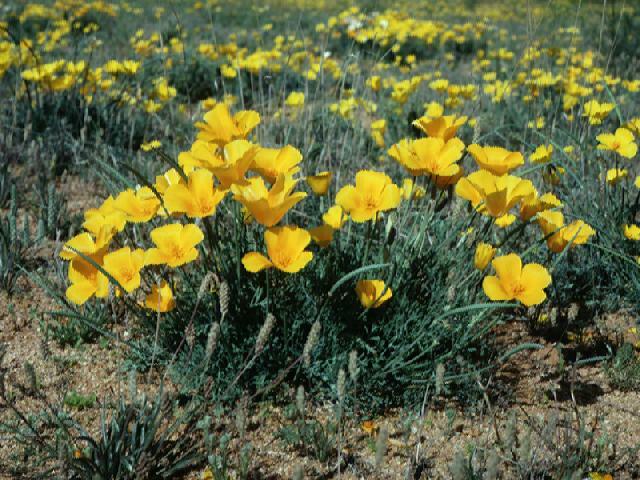 Plants which key to E. californica have also been collected from the western Vizcaíno Desert and the Cape Region of Baja California Sur. The subspecies interbreed freely in cultivation. 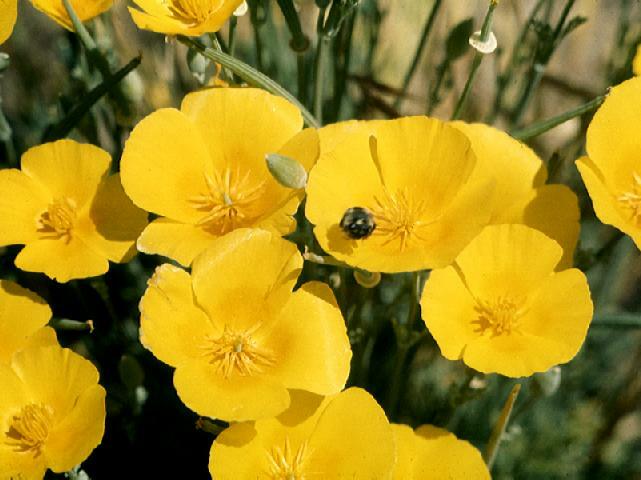 One interesting variant of E. californica is listed as E. procera (Kernville poppy) by the California Native Plant Society Rare and Endangered Plant Inventory. These plants seem to be restricted to the immediate vicinity of Kernville in the southern Sierra Nevada (Twisselmann, 1967). They are larger than most other inland poppies, with large flowers and stout stems. In cultivation, they interbreed with other E. californica. Eschscholzia californica is distinctive for its expanded rim of the receptacle below the petals. In addition, ssp. californica has bifid linear cotyledons (they are entire in ssp. mexicana and in the other species of the genus), and many of its populations are perennial. Flower color ranges from a uniform orange to various orange spots and shadings at the base of deep yellow or golden petals. In both subspecies, occasional individuals have white, cream, pink, or red flowers, or combinations of these. These natural color variants are the raw material of many of the cultivars. Although E. californica has escaped from cultivation in many parts of its native range, it is often possible to identify native populations by their seed dormancy, which is generally absent in plants of cultivated heritage. PLANT perennial herb or annual, 0.5-6 dm tall, erect or spreading, glaucous or glabrous. TAPROOT heavy in perennial forms. LEAVES basal and cauline, terminal divisions obtuse or acute. INFLORESCENCE cymose or solitary. FLOWERS erect in bud; receptacle conic, usually with a spreading distal rim; calyx acute to long-pointed, glabrous or glaucous; petals 2-6 cm long, yellow, usually with orange spot at base. FRUITS 3-9 cm long. SEEDS 1.5-1.8 mm diam, spherical to ellipsoidal, reticulate, brown to black. 2n=12. Grassy and open areas; 0-2000 m; California Floristic Province, extreme western Mojave Desert, desert mountains; to s WA, sw NM, nw Baja California. California state flower. A highly variable species. Plants of California Floristic Province and adjacent regions (subsp. californica) have bifid cotyledons; the annuals of the desert mountains, AZ, NM, NV with entire cotyledons are subsp. mexicana (E. L. Greene) C. Clark). A large-statured variant of subsp. californica (UNCOMMON) from the Kernville region has been called E. procera E. Greene.